With the first ice—a skim on a sheep pail so thin it breaks when touched—one family’s winter begins in earnest. Next comes ice like panes of glass. And eventually, skating ice! 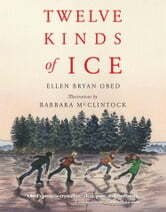 Take a literary skate over field ice and streambed, through sleeping orchards and beyond. The first ice, the second ice, the third ice . . . perfect ice . . . the last ice . . . Twelve kinds of ice are carved into twenty nostalgic vignettes, illustrated in elegantly scratched detail by the award-winning Barbara McClintock.